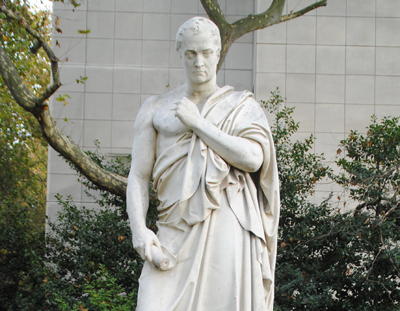 OK, so for those who were wondering, this statue, an 1836 marble by John Gibson, depicts William Huskisson, a Tory politician and financier who was present at the fall of the Bastille in Paris on 14th July, 1789, but became best known for being the world’s first railway casualty after he was run over by George Stephenson’s locomotive engine, Rocket, when he failed to see the oncoming train while trying to speak to the Duke of Wellington. The statue is located in the Thames-side park, Pimlico Gardens. Clearly statue identification is not a skill set of mine.